I rarely purchase guitar strings from local merchants anymore. One reason is there are fewer local merchants still in business. I do have a Guitar Center nearby and another music store located less than 10 minutes from the Guitar Center. The problem with both stores is they rarely have the strings I want in stock. I might be able to get the strings from the guitarcenter.com website, but even they don’t carry some of the strings I like. There is one very nice thing you can do if you have a nearby Guitar Center and are desperate for a specific string. Go online, find the string at their website and then check local availability. Enter your zip code and it the website will list nearby stores that have that item in stock. This can save you a trip to the store only to discover they don’t carry it or it is out of stock..
I’ve been purchasing almost all my instrument strings online for over a decade. Although musiciansfriend.com and other online music stores carry strings and I’ve occasionally purchased strings from them, particularly when the strings were part of a larger order, most of my string purchases are from merchants that specialize in instrument strings. There are a number of online string specialty stores. I’ve dealt with several. Until recently my preferred string site was JustStrings.com. They have a well organized website making it easy to find the strings you need by instrument, type of music and other criteria. It’s difficult to find a brand or type of string they don’t carry. However, I’ve recently stopped ordering from them because of their shipping charges and policy. They charge a flat $6.95 for any sized order. Considering how easy it is to find free shipping, this is a lot. Maybe they think their shipping policy will encourage you to buy more sets of strings at a time. But sometimes I only need or want one or two sets of strings. I recently purchased classical guitar strings for my new classical guitar from StringsandBeyond.com. I had bought from them more than a decade ago. They have a good selection of strings. Their shipping charges are $3.95 for any sized order and free shipping for orders over $35. Considering the strings I purchased were priced identically at JustStrings.com and StringsandBeyond.com, Strings and Beyond is a better deal. My complaint about their website is it isn’t as easy to find different types of strings. For example not all of their flat wound electric guitar strings showed up under a Jazz Guitar category. A third online store is StringsByMail.com. I noticed several items that were not available at StringsandBeyond.com. For example D’Addario Pro Arte Carbon (EJ46FF) and Dogal Diamente sets are not carried at Strings and Beyond but are available at StringsByMail.com. StringsandBeyond.com carries D’Addario but not the EJ46FF Carbon sets. JustStrings.com has the EJ46FF from D’Addario but neither they nor StringsandBeyond.com carry Dogal Diamente classical guitar string sets. Shipping charges at StringsByMail.com are similar to StringsandBeyond.com. Another category for guitar strings on the web is Webstrings.com. They supply strings made by others and branded for their website. In other words, these are OEM generic strings. They are probably made by one of the large guitar strings manufacturers you’ve used. The advantage is they can keep the price down. I’ve used several strings Webstrings.com. For some guitars all you need is something generic. Examples (prices subject to change). Example 1. Common electric guitar string you can find anywhere. Conclusion: If you can find free shipping, one of the big musical instrument retailers is your best bet. Better still, you can probably find these strings at your local store at about the same cost. 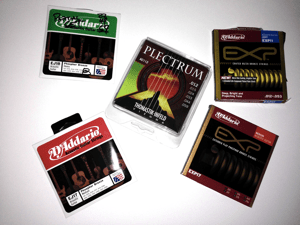 You can’t buy these new D’Addario classical strings at two of the merchants I’ve listed. You save the most at Strings by Mail. This brand of classical string, which is getting good reviews from classical guitar forums, is only available at Strings by Mail. RotoSound monel flat wound strings for guitar are only sold at JustStrings.com of the merchants I’ve reviewed. Each store has some things you can’t get elsewhere. RotoSound Monel flat wound strings can be found for basses at several merchants and you can also get round wound Rotosound guitar strings at several merchants. But the Monel flat wound guitar strings are difficult to find. Ukulele, mandolin, banjo and other instrument strings are even more difficult to find at local stores and if you want anything other than the most common type of string, difficult to find at the big online merchants. The specialty stores listed above are more likely to carry these strings. Another merchant that I recommend for unusual strings is Elderly.com. That’s where I found Worth fluorocarbon ukulele strings.